In a previous post, I mentioned that I used to be a 2.6-GPA computer engineering major. Now, I’m a psych major getting 4.0’s, and am working in 2 research labs. I'm close to submitting a research paper to an academic journal. I also dance, and manage a large student organization. Here’s the thing: I never do work past dinnertime, nor on Saturdays, and I never have done an all-nighter to do school work or study. When I switched majors in the summer of 2013, I was figuring out how to recover from the depths of my low GPA and hit the ground running in my new major. Eventually, I found out about a time management system from Cal Newport’s How to Be A Straight-A Student. I decided to utilize it with my own spin. Only takes 5 minutes of planning a day. Is flexible enough to accommodate toward any daily uncertainties. Helps you remember, plan, and complete things without procrastinating. Can easily be restarted after not following it. Eventually, the system grew into something that allows me to get an abundant amount of work done and still have plenty of free time. I’d like to share with you an in-depth look at my personal time management system. A calendar. Something that can be referenced to daily. I use Google Calendar, because it’s easy to tweak and syncs with my phone. Any other electronic or paper calendar will work too. A list. This will be your master task-list that you’ll be carrying and updating throughout the day. I use Google Tasks on Google Calendar, and the GoTasks app, (to use Google Tasks on my phone). If your style is analog, a handwritten list can also work. Record all of your to-do’s and deadlines onto your calendar. Every morning (or night before), plan the upcoming day. Throughout the day, whenever some to-do or deadline pops up in your head, jot it down on your list. 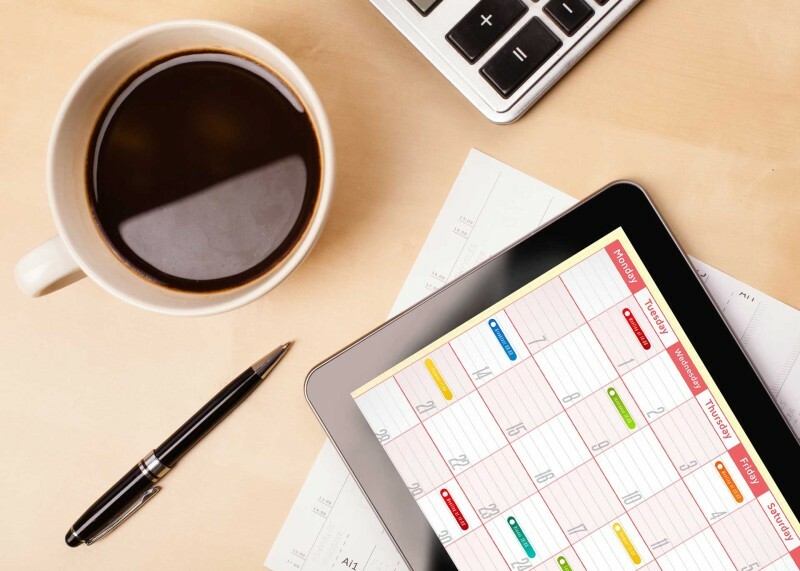 Transfer these new to-do’s and deadlines onto your calendar. Then, plan your next day. Step 1: Put all of your classes, appointments, and deadlines on your calendar. Every deadline from every class you have (weekly assignments, paper due dates, midterm/final dates), goes on your calendar. Meetings for any clubs you’re involved with, and deadlines for any summer internships you want to apply for also go on your calendar. Step 2: Plan your day, and use the plan as your day’s guide. Every morning of (or the night before), take 5-10 minutes to look at the list for the day. Look at which tasks are priority to get done, and plan the times you will get done each specific task. I like doing this the day before, at the end of my workday before I eat dinner and frolic with my free time. All of my appointments are listed: class in the morning, 3 meetings, and a dance performance/dinner. My two big tasks that I want to accomplish for the day are Finish reading Hybrid classes paper and Transcribe Interview # 3. Since I was meeting my faculty mentor this day, I realize I need to prepare what I want to bring up to him. I also know Buy scantron and Call for fundraiser request won’t take long. 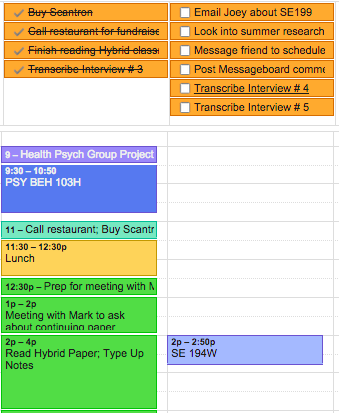 I scheduled each specific task to a time frame I’ll get the task done, so that I don’t have to do work past 6pm. In addition, this day I ran into one of my good friends on campus at 11:30am. I haven’t seen this friend in a while, so I decided to get lunch with her then (instead of at 12). Relax. Here’s where the system is flexible. I swapped Lunch with Prep for meeting with Mark. This way, I got to have lunch with my friend AND still prepare for that meeting. I almost always change around my plan for the day. And that’s okay. As long as you know how to switch plans and ensure you accomplish what you want to accomplish, this system is flexible. Step 3: Capture to-do’s that pop up in your head throughout the day. How common is it for us students to get an assignment due in two weeks and think to ourselves, “I have plenty of time to do this, I don’t need to work on it now,” but not think about it until the day before it’s due? This step will help prevent you from frantically submitting assignments three minutes before it’s due. It's often your professor will talk about a deadline for a new assignment or a date for a quiz. Or maybe a friend told you about a study abroad program that you decided you want to apply for. In these instances, immediately capture it onto your list, and then move on with your day. If it’s a deadline and you’re using an electronic Calendar or easy-to-carry planner, mark the deadline onto your calendar. Take my earlier example. While sitting in class, I remember that I wanted to look into summer research opportunities. So I jot it down on my list. I also remember that I needed to email my faculty mentor to get units next quarter. I jot it down. During my lunch with my friend, it hits me that I’ve been meaning to message another friend to get dinner. So I jot that down as well. Step 4: Repeat Steps 2 & 3. Now, move the tasks you captured throughout the day to the next day (or to other days, depending on the task). If your list is paper, you'll have to manually transfer your tasks to your calendar. Then, use these next day tasks to plan the next day. We’re now back at Step 2. Be specific about when you’ll get the task done. The common thing that us students do is to try to complete our to-do list in our free time throughout the day. Don’t do this. You’ll feel more overwhelmed when you have 9 things on your to-do list and will take a long time to figure out where to start. Be intentional about when you'll start and finish a task. Also, be specific about the tasks themselves. Remember my previous post? Notice how I didn’t put do research stuff or do health psych stuff in between my classes and meetings. I was specific about what I want to get done by when. This is key to efficiency. Batch your quick tasks. For example, my tasks of Call restaurant for fundraiser and Buy scantron do not take long, so I batched them in one time block from 11-11:30am. Be okay with deferring a task, so you don’t have to think about it until then. Not every task is urgent. Since this was in the Fall quarter, Look into summer research opportunities didn’t have a super pressing deadline. I moved this task onto Friday of the next week. Expect to hit a rough patch in your system. There are days where I don’t entirely follow my daily plan. This happens to everyone; the good thing is, this system is adaptable to periods of neglect. When restarting the system, dump all to-do’s in your head onto your list, and then push the deadlines you can push to future dates. I don’t believe that being a great student requires long, arduous hours of working. As long as you have a system that works for you, you can be a relaxed, efficient student who receives awesome opportunities AND still has an enjoyable college experience. Anyone who wants to accomplish a lot and still carve out a lot of free time should have a personal time management system. You don’t need to follow my system step-by-step. Heck, you don’t need to follow my system entirely. You just need a time management system that works for you. What is your system? What are some techniques that help you manage your time? Feel free to let me know what’s been working for you, or if you’d like any more tips on making a personal time management system. How to be a Straight-A Student by Cal Newport. Deep Habits: The Importance of Planning Every Minute of Your Work Day by Cal Newport. Back to GTD: Do a fast "mind sweep" by Merlin Mann. Picture credits go to MarketingLand.